I have always loved stories in small towns – books, TV shows, movies. And I’ve always thought that I would want to live in a small town. Detractors will tell you (and me) that it would be horrible; everyone knows everyone else . . . and their business. But I see the benefits: people who know and care about you, such a strong sense of community. I think it’d be great. But, since I don’t live in a small town, my city has a population of about 37,000, I have to live in a small town vicariously. And my favorite way to do that is in books. 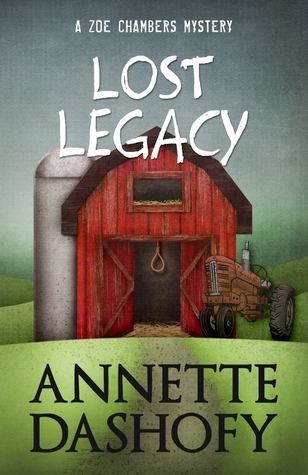 In Lost Legacy, Annette Dashofy invites readers to Vance Township, Pennsylvania. There, Paramedic Zoe Chambers responds to a call at the farm where her extended family used to live to find an elderly man hanged in the barn. It appears to be the scene of a suicide – an older man facing terminal lung cancer choosing to leave this world on his own terms. But the scene is all too familiar to Zoe as the scene of two other deaths many years earlier. Soon, events in and around Vance Township begin to spiral out of control. Zoe’s mother and stepfather arrive for a visit in the midst of these suspicious circumstances. And before she knows it, Zoe is questioning everything she thought she knew about the accident that killed her father. At Zoe’s side throughout is her friend and Police Chief Pete Adams. Both Pete and Zoe have growing feelings for one another, but neither want to be the one to make the move past the line of friendship. As much as I like the characters of Zoe and Pete, there is another character in Lost Legacy who drew my attention – Pete’s father, Harry. Harry has Alzheimer’s disease and, in many ways, he reminded me of my grandfather, who also had Alzheimer’s. The love and care and warmth that Annette Dashofy used in creating and portraying the character of Harry earned my attention and respect. I thank her for that; sincerely. Lost Legacy is a great puzzle of a mystery with many intriguing characters and moving pieces that continually shift into new pictures of possibility. I’m very much looking forward to my return to Vance Township with Pete, Zoe, and the rest of the characters living there.